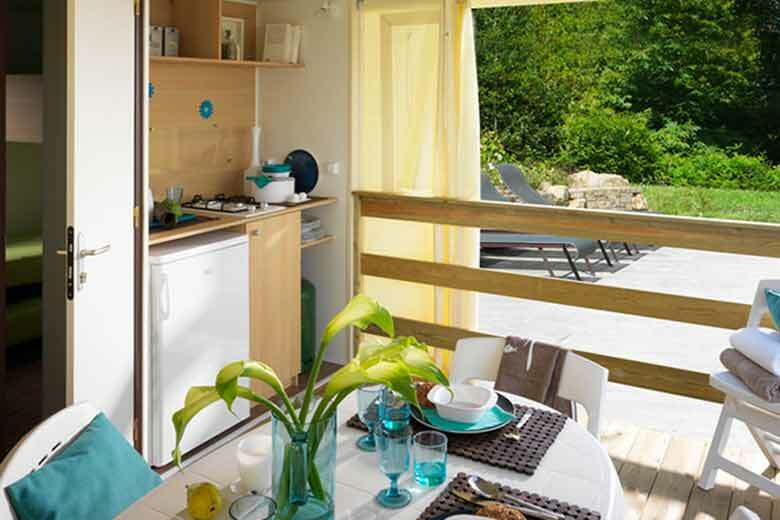 The Les Avignon campsite offers cottage rentals in the Gard near Avignon. Several types of accommodation are available for all kinds of trips with 4 to 6 people. You can relax close to nature while still enjoying modern comforts. These accommodations are the ideal solution for visiting the Avignon Festival or for a family holiday to discover Avignon, Villeneuve-lez-Avignon and the Gard. You can sleep comfortably and enjoy the performances, the campsite is located 10 minutes walk from the Festival. Note that a city tax applies for all guests over 18 and that a deposit must be paid upon arrival. Comfortable mobile home for 4 people. With two rooms, a living room/kitchen and a terrace. These canvas and wood cottages provide an excellent compromise between a tent and a mobile home. The Comfort Cottage is a well-lit mobile home that will guarantee you maximum comfort.